Tranquil oasis in the heart of Wine Country! Enjoy the privacy of no neighbors behind you with a backyard paradise perfect for entertaining. Bright and airy with a popular open floor plan displaying lovely pride of ownership and stylish upgrades through out. Highlights include solar energy, wood-like floors, upgraded white kitchen overlooking family room, vaulted ceiling, spacious master suite, low maintenance landscaping, sparkling pool and spa overlooking mountain views and so much more! 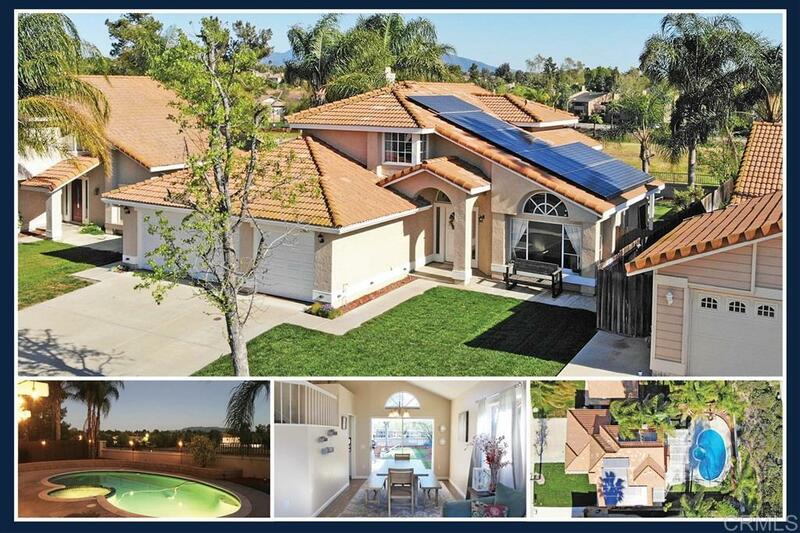 See supplement, Tranquil oasis in the heart of Temecula Wine Country! Enjoy the privacy of no neighbors behind you with a backyard paradise perfect for entertaining. Bright and airy with a popular flowing open floor plan displaying lovely pride of ownership and stylish upgrades through out. Highlights include solar energy system, wood-like flooring, upgraded modern white kitchen overlooking family room, vaulted ceiling, formal living and dining room, spacious master suite, low maintenance landscaping, and so much more. Step outside for endless relaxation featuring a sparkling pool, heated spa, and covered patio area overlooking picturesque sunsets and mountain views!